“Our movement and people are being destroyed in an unbelievable way, with silence from everyone. We feel, your Excellency, that the United States has a moral and political responsibility towards our people, who have committed themselves to your country’s policy.” Kurdish leader Mustafa Barzani’s message to Kissinger, 1975. “Promise them anything, give them what they get, and f… them if they can’t take a joke.” Kissinger to a staff member regarding the Kurds, 1975. In 1958, a military coup led by General Abdul Karim Qassim overthrew the Iraqi monarchy and, for the first time in history, the provisional Constitution of the new republic of Iraq proclaimed that “the Arabs and Kurds are associated in this nation.” President Qassim, whose mother was a Kurd, invited Mulla Mustafa Barzani, leader of the Kurdish movement since 1946, to come back from exile in the USSR. The Mulla and his followers were received with joy in Baghdad. Their friendly relationship lasted for only five years. The Baathists overthrew Qassim and executed him in 1963. Until 1972 the struggle for basic autonomy by the Kurds was most often suppressed by Baghdad. The Kurds in Syria, Turkey, and Iran also were seriously involved in attempts to obtain at least some basic human rights. Sadly, all failed. By the time President Nixon was elected and Dr. Kissinger became the most important American foreign policy decision maker, Iraq had already developed a very friendly relationship with the former USSR. Washington did not like this cozy-client link between Baghdad and Moscow. As a result, a tripartite plan was formed between the US, Iran, and Israel. In this plan, the Kurds were given adequate support to keep make Baghdad busy and take its energy, but not enough to achieve any meaningful results. Some old and rusty Russian-made weapons captured by America in Vietnam and those seized by Israel from its Arab neighbors were given to the Kurds in Northern Iraq. The Baathist forces withdrew from Kurdistan and a much weaker Iraqi government made both Iran and Israel very happy. Unfortunately for the Kurds, during an OPEC meeting in 1975, Saddam and the last Shah of Iran agreed to settle their differences and signed a treaty of friendship, known as the Algiers Agreement. In this treaty Iraq formally conceded to Iranian territorial demands in return for the Shah terminating support for the Iraqi Kurdish rebels. Dr. Kissinger approved this agreement that marked the end of Kurdish autonomy in Iraq. Indeed, the Shah was more worried about the uprising of the Iranian Kurds than about what was going on in Iraq. However, as a weak puppet, the Shah was only doing what Dr. Kissinger told him to do. The end result, nevertheless, was the collapse of Kurdish resistance and the onslaught of Saddam’s Anfal plan and killing machine of genocide. This is one of the West’s worst records of cynical-bloody betrayal of the Kurds. Shortly after the withdrawal of American help, a reign of terror began in all of the countries where the Kurds lived, but the worst was carried out in Iraq, resulting in the systematic killing and genocide of hundreds of thousands of civilians. According to Kurdish leaders, some 182,000 mostly unarmed civilian Kurds were murdered. Although, this reign of terror was ended in 2003 in Iraq and it may end in Syria soon, it is continuing in Turkey and Iran. The Turks still receive help from the US to terrorize and control their Kurdish population, the largest in the world. 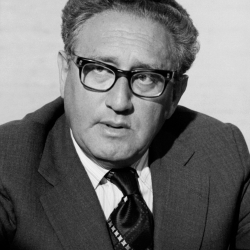 Henry Kissinger’s realpolitik or political realism refers to politics or diplomacy based chiefly on power and on practical and material considerations, rather than ideological notions or moralistic or ethical premises. This makes him a cold-blooded political murderer and war criminal. He left his bloody fingerprints behind in more than a dozen countries, such as Vietnam, Cambodia, Taiwan, India, Pakistan, Bangladesh, Iraq, Iran, Turkey, Syria, Cuba, Argentina, Chile, Cyprus, and Indonesia’s East Timor. The American carpet-bombing of Vietnam and Cambodia left hundreds of thousands of civilians, mainly peasants, dead. Although a Jewish person, Kissinger can be heard saying on one of the Nixon Tapes that even the life of the Jews in a gas chamber in the USSR was not of his concern. Mulla Mustafa Barzani, facing so many harsh circumstances, was also a realistic person. He had a very bad experience with the Shah of Iran. Thus, he was not surprised by the Shah’s duplicity. But, it was not easy for the Mulla to understand that a superpower would let him down so abruptly. Mr. Barzani was ready to make Kurdistan into a 51st state of the US and provide crude oil for it. He sent a few desperate requests to the CIA, Dr. Kissinger, and President Ford. Mr. Barzani received no reply from any one of them. Mr. Secretary even denied the Kurdish request for humanitarian help from the US. Apparently, when Kissinger was the king in Washington hardly anybody was able to criticize him. By early 1972, he was the real American Super Secretary of Sate. As “Man of the Year”, he appeared on the cover of Time magazine in 1972. Kissinger and Le Duc Tho of Vietnam were jointly awarded the 1973 Nobel Prize. Tho declined the money but Henry harried to his bank happy with the blood of many innocent people on his hands. Safire, formerly a Nixon speechwriter, criticized the most visible member of the old Nixon gang. The last Shah of Iran, then, “offered to help the Kurdish people- a non-Arab ethnic group-nearly three million of whom live in Iraq-in their long struggle for autonomy.” According to him, the Kurds were “an ethnic group that only wanted to speak its language and pursue its cultural tradition… has been systematically uprooted and dispersed.” The US, Israel, and Iran wanted to tie up a radical Arab army in Iraq. But, as Safire (1977) argued, “In 1973, Kissinger did not want to [further] weaken the Arab cause.” “The word went to the Kurds from the US and the Shah: Do not attack.” The Kurds had to listen! Only a couple years later, directed by Kissinger, in the spring of 1975, the last Shah of Iran made a deal with the devil and sold out the Kurds, cutting off all supplies and telling them to give up any hope of autonomy. Abdulla, a Kurdish scholar who knew Mulla Mustafa, wrote, “Barzani did not trust the Shah but trusted America. That was the mistake Mulla Mustafa made” (2012, p. 152). Mulla Mustafa visited the US twice. The first time in 1975, he was received as a national leader. The second time in 1979, he was not welcomed although he came for lung cancer treatment. According to Abdulla, Barzani was “a great embarrassment to Henry Kissinger as a constant reminder of the crimes he had committed against the Kurds” (p. 161). In 1979, coincidently, the Shah of Iran, with the help of Dr. Kissinger arrived here too, and was sequestered somewhere in the US for his cancer treatment. Under Kissinger, American foreign policy led to the loss of human rights of the Kurds. The Shah then pulled the Persian rug out from under the feet of the Kurds! Almost a decade later, in 1988, Safire wrote that genocide, mass murders within borders, should not be ignored even if it happened within a sovereign state. He reported that the stench of genocide drifts from the Kurdish and the Hutu areas. Of course, to him, in the case of the Kurds, Kissinger was the main cause. Later, a major blow to Kissinger’s legacy came from a bright British journalist by the name of Christopher Hitchens. In his book, The Trial of Henry Kissinger, Hitchens (2001) called for the prosecution of Kissinger for war crimes, crimes against humanity, and crimes against international laws, including conspiracy to commit murder, kidnap, and torture. 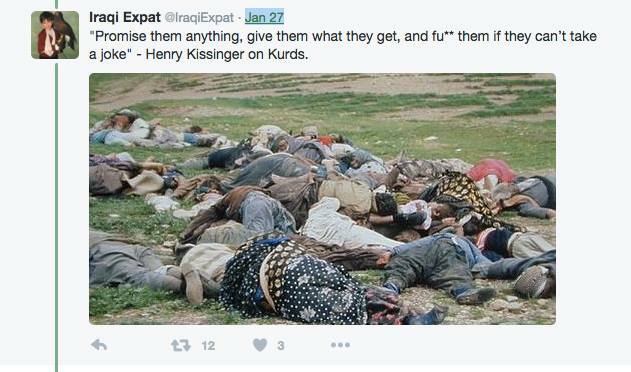 For examination of the alleged war crimes of Henry Kissinger, Hitchens presents evidence of Kissinger’s involvement in a series of war crimes in a dozen nations including Kurdistan. Dr. Kissinger is in fact the single greatest unpunished murderer in the world. He is now a wanted war criminal. A few countries have already issued arrest warrants against him. Paul Bremer was then seen as a messenger of calamity, disaster, and devastation. It was not uncommon, almost every morning, to see a few severed human heads in black plastic bags on the streets of many Iraqi cities. Also, no day passed, again mostly in the cities, without seeing stray dogs eating the flesh of human corpuses. In addition, Bremer, a sycophant and arrogant student of Kissinger, verbally insulted Mulla Mustafa Barzani. When he saw a picture of the Kurdish leader, Bremer allegedly said, “Who is that Dervish?” This word may be a reference to a humble and modest person. But, having learned it from the master, who is familiar with the British Imperial lexicon, Bremer did not mean well. His statement suggested disrespectfully the Kurdish national leader was a beggar, penniless, and homeless. Sadly in August of 2012, Foreign Policy picked Dr. Kissinger as one of the 50 most powerful Republicans on American foreign policy. This magazine wrote, “When Henry Kissinger speaks, the world still listens.” In an interview with the BBC on January 24, 2013, he expressed concern about Iran’s nuclear program and Syria’s civil war. Apparently, he is still catching up with the news. It is true that his name has become synonymous with realpolitik, but he is still a real criminal behind a number of cases of genocides. He should not be allowed to speak or be listened to. In addition to Kurdistan, he must be prosecuted for his global genocidal involvement in Cambodia, Laos, Vietnam, East Timor, Bangladesh, Cyprus, and Chile. Unfortunately, the world’s number one state terrorist is still at large. His trials would be a defining case for the West’s judicial credibility. Before he dies, he must be tried and punished as a war criminal and his wealth given to study and prevent genocide around the world. As a dreadful, disgraceful, and discredited man, Dr. Kissinger, now should have the door shut in his face by every decent person and should be ostracized, shamed, detested, and dishonored. He has the blood of hundreds of thousands of innocent people on his hands. He should be punished before he expires. It would be an excellent lesson to others who want to commit crimes against innocent humans. Abdulla, Jamal Jalal. The Kurds: A Nation on the Way to statehood. Bloomington, Indiana: AuthorHouse, 2012. Foreign Policy. “The 50 most powerful Republicans on foreign policy.” August 24, 2012. Groth, Alexander J. “Henry Kissinger and the Limits of Realpolitik.” The Israel Journal of Foreign Affairs, Volume 5, No. 1, January 2011, pp. 111-115. Hitchens, Christopher. The Trial of Henry Kissinger. New York: Verso, 2001. Hitchens, Christopher. “How Can Anyone Defend Kissinger Now? The Nixon tapes remind us what a vile creature Henry Kissinger is.”slate.com, Posted Monday, Dec. 13, 2010, at 11:28 AM ET. Latham, Aaron. “Kissinger-Safire Feud.” New York Magazine, Vol. 9, No. 13, March 29, 1976, p. 34-36. Safire, William. “Of Human Rights, Kurds and Kissinger.” Sarasota Herald Tribune, Wednesday December 21, 1977, p. 7-A. Also by the author: Koohzad, M. “Kurdistan Ignored Even by American Professional Geography Textbook Writers.” The International Journal of Kurdish Studies, Vol. 22, Nos. 1 & 2, 2008, pp. 173-192.